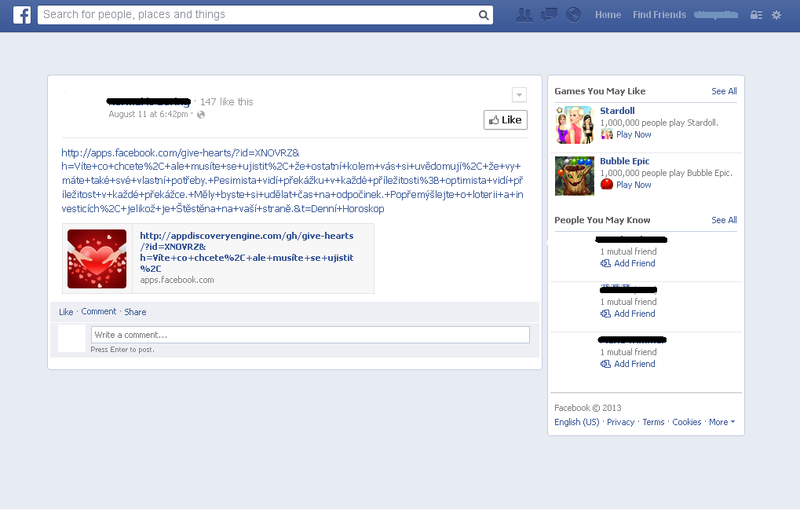 Recently, we have seen many Facebook posts with links leading to applications called Give Hearts, Drink It Up and Daily Horoscope. The applications are very popular – they have over 5 million monthly users – and are managed by the same provider called App Discovery Engine. The posts attracted my attention because they seem to be posted automatically. The entire post consists of the URL which contains quite long text separated with '+'. (Later we will see that the text is a horoscope that you see on the page of the application). To begin investigating these apps I follow the link leading to the Give Hearts application. It redirects me directly to the application. But before I can use it I am asked to grant Give Hearts access to information on my Facebook account like my email or friend lists. Then I have to agree that the application will post on my behalf. That means that I allow it to write whatever it wants on my wall whenever it wants. The only thing I can affect is who will see the posts. I can choose that they will be visible for everybody, only for my friends, or only for me. When I start to use the Daily Horoscope application, I have to agree to give the application access to even more information like work histories or status updates. After I have agreed with their terms, I have to skip a "word from their sponsor" which is in fact a window with an advertisement. Finally, I can use the application. 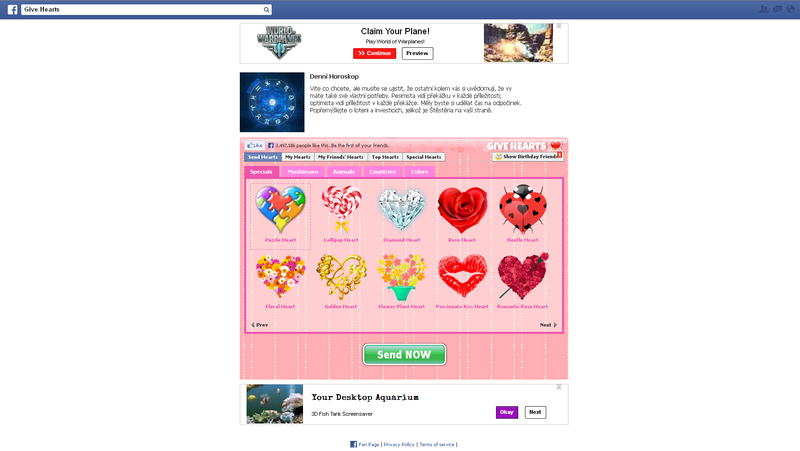 As the title suggests, the Give Hearts application allows me to send colorful hearts to my friends. 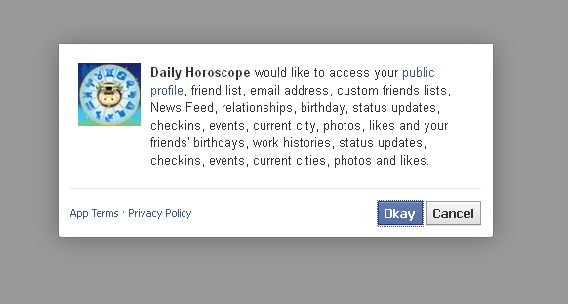 On the page with the application there are also two advertisements and a post from the Daily Horoscope application. The text of the horoscope is the same as text in the link that I have followed to get to the application. I find it quite unusual that this kind of application needs to have so many privileges. So, I decide to look into the App Terms to get an idea what they will be using the information for. Not many people spend a half an hour reading Term of Services of an application which they will use one or twice for 2 minutes. I did not read the whole terms either, but at least I briefly looked into it. In the Give Hearts' App Terms (hxxp://www.appdiscoveryengine.com/tos.html) I looked up the words "fee" and "personal data". Fees: You acknowledge that App Discovery Engine reserves the right to charge for any portion of the Service and to change its fees (if any) from time to time in its discretion. You agree to pay all fees when due in accordance with the terms set forth on the Site. Adding an application is pretty easy – just click on one button. Removing it when you get bored with it is just as simple. 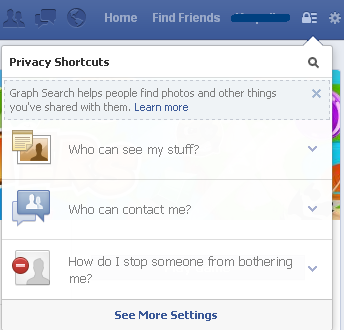 Open your Privacy Shortcuts window (click on the padlock icon) and follow the "See More Settings" link. In the app settings there are all applications that you have used. Pick the one you would like to remove and edit it. Now you see all information about the app like visibility of app and posts or stuffs that the app can do with your account. On the last row in the small window there are "Remove app" and "Report app" links. 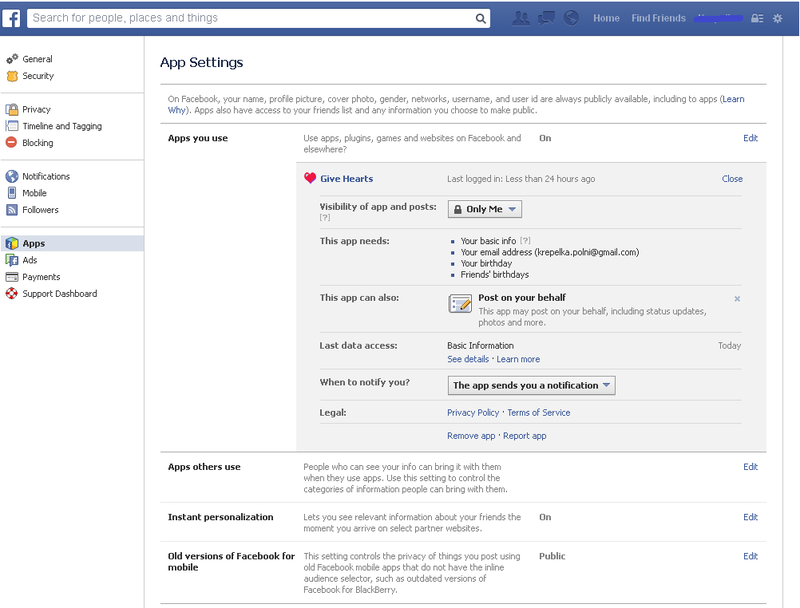 If you mean to report the app or some its bugs to Facebook or app developers, do that at first. Do not be shy and pick the real reason why you are doing that. Now it is time to remove the app. Click on the "Remove app". It is better to select "Delete all apps activity" too, especially when you are removing the app because of security reasons. 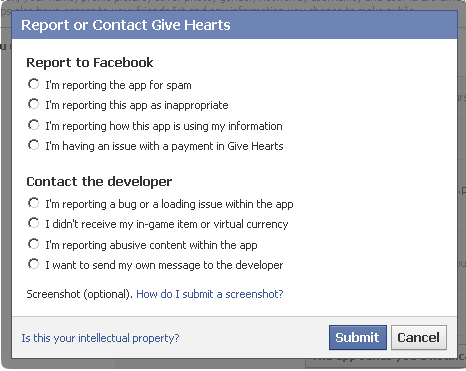 I have reported Give Hearts, Drink It Up and Daily Horoscope to Facebook because I found it suspicious that they required the access to nearly all the information on your Facebook account and there was a possibility that App Discovery Engine would establish fees and I would have to pay for using the applications in the future according to their Terms of Services. Unfortunately, I have received no response and nothing has happened.